Home > For patients > What is endovascular neurosurgery? Endovascular Neurosurgery is treatment from the inside of the blood vessels. Traditionally a neurosurgeon has had to open up the skull or neck to see the outside of the blood vessels – a modern alternative has been to approach the vessels with tubes (or ‘catheters’) often gaining entry to the blood vessels from the top of the leg. The treatment is guided by the appearance of X-ray dye injected directly into the blood vessels to produce an angiogram. 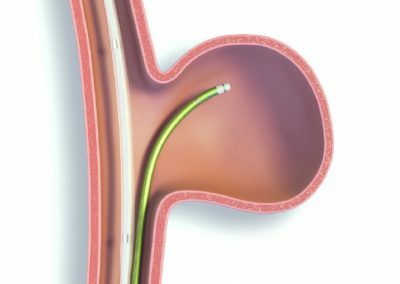 Endovascular treatment options are appropriate for many different conditions affecting the brain and spine. 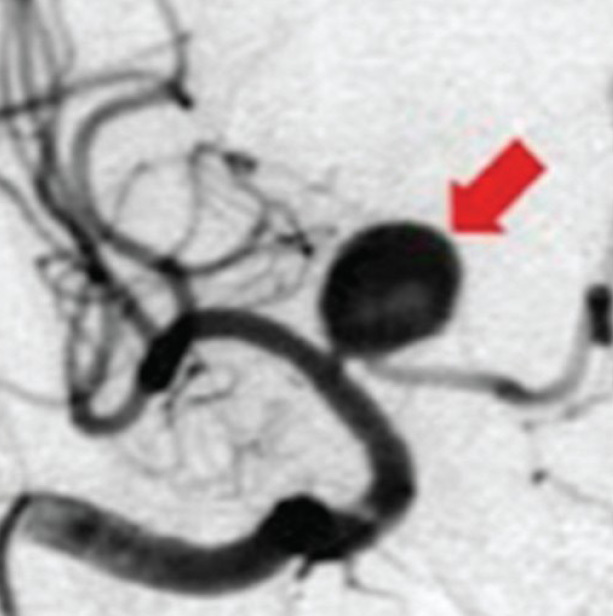 Aneurysms are weaknesses in the arteries of the brain. They are somewhat like balloons and are thin walled – with a risk of bursting (‘rupturing’). 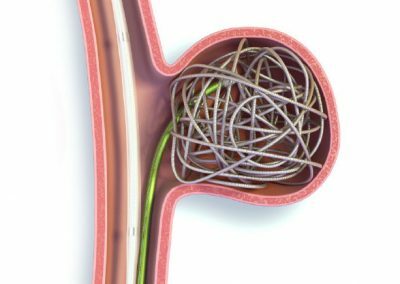 There is now evidence that for some aneurysms the safest treatment is with a technique called ‘coiling’. 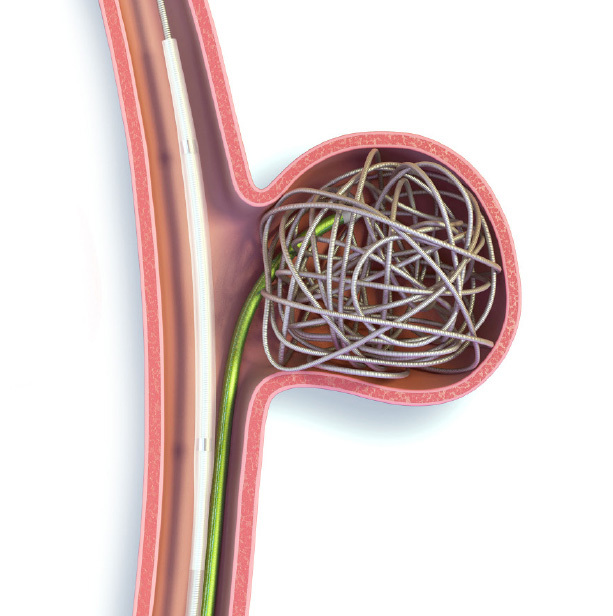 This involves passing a tiny tube (catheter) right into the aneurysm and filling the aneurysm with metal or other types of ‘coils’ – like very tiny pieces of wire wrapped as a spring. Thus the aneurysm can be filled so that no more blood enters and it seals over. Narrowed arteries going to the brain (carotid or vertebral) can be a source of stroke. Sometimes the safest treatment is to open the artery from the inside. 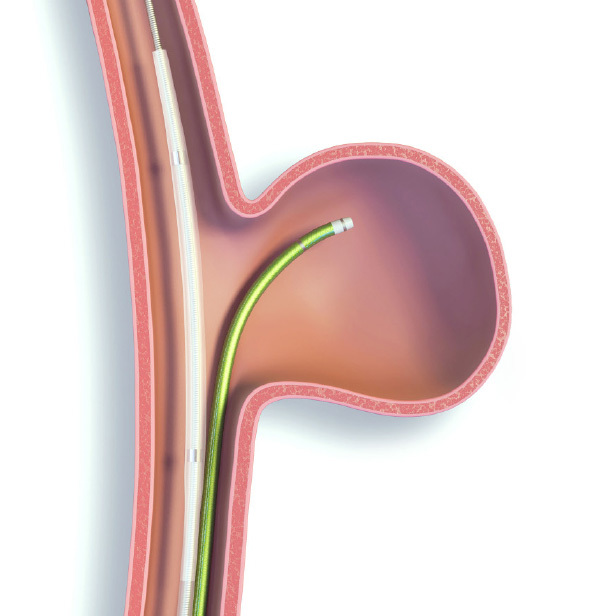 This can involve using a balloon (‘angioplasty’) or a metal cage called a stent. 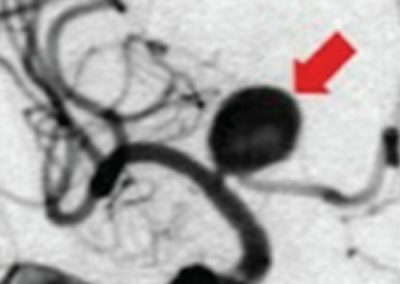 These techniques can also be applied to blood vessels within the brain (intracranial angioplasty). Some tumours bleed excessively during surgery and benefit from treatment through the blood vessels to block off the blood supply before surgery (embolisation). Related to endovascular treatment is interventional spine treatment. This includes injecting cement into a vertebral body to treat a painful fracture (vertebroplasty), and injection of medications to treat spinal pain. Modern angiographic equipment can even show three-dimensional pictures of the blood vessels in the brain – as in the animation shown below. Some of these are best treated with embolisation. This is done by injecting either glue or more recently a black material called Onyx into the AVM to decrease its blood supply. This can be prior to surgery or occasionally instead of surgery. Endovascular Neurosurgery is treatment from the inside of the blood vessels. Traditionally a neurosurgeon has had to open up the skull or neck to see the outside of the blood vessels – a modern alternative has been to approach the vessels with tubes (or “catheters”) often gaining entry to the blood vessels from the top of the leg. 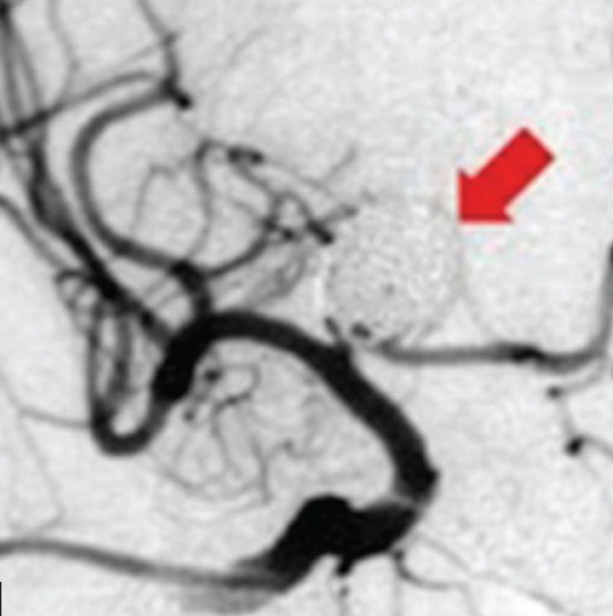 Aneurysms are weaknesses in the arteries of the brain. They are somewhat like balloons and are thin walled – with a risk of bursting (‘rupturing). 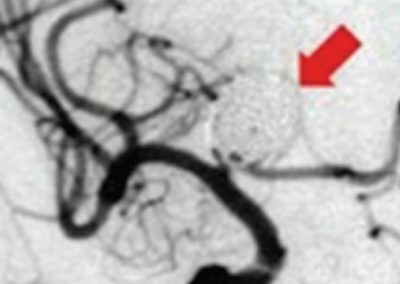 There is now evidence that for some aneurysms the safest treatment is with a technique called ‘coiling’. 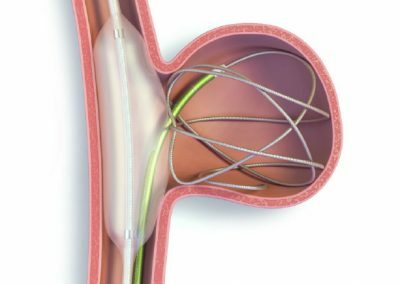 This involves passing a tiny tube (catheter) right into the aneurysm and filling the aneurysm with metal or other types of ‘coils’ – like very tiny pieces of wire wrapped as a spring. Thus the aneurysm can be filled so that no more blood enters and it seals over.